Absolutely, if you choose wisely. 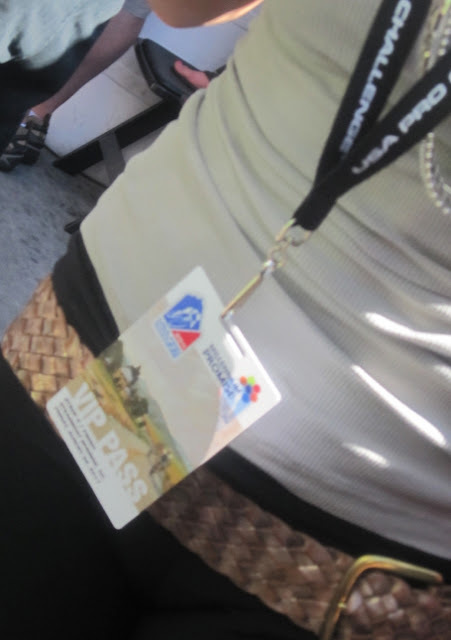 Hang that VIP badge around your neck and suddenly you feel special. 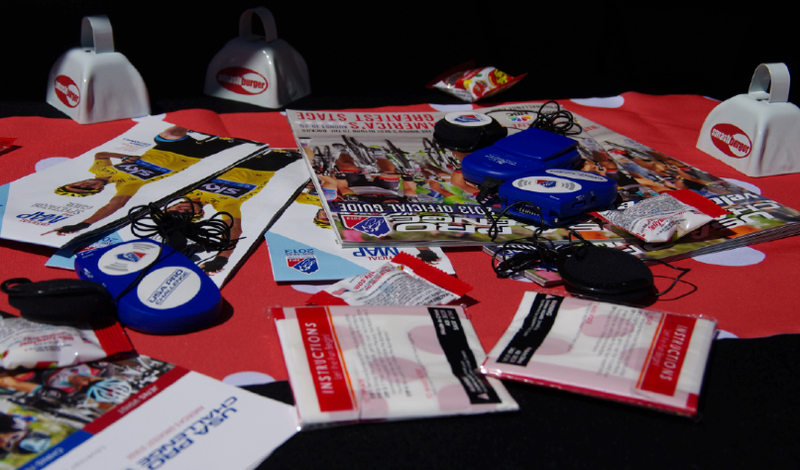 You feel invested in the race, displaying your support of bike racing to the public. Enter that VIP tent and you feel as if you have found your place among the other badge wearing happy VIP goers who love cycling. One of a select few (okay hundreds) who have bought your ticket and planned ahead for a comfy race experience. Happy you will be in your investment - if you choose your stage right. By buying a VIP ticket, you will surely add a level of comfort, convenience, excitement, nourishment, race course view and people watching to your day at a bike race. 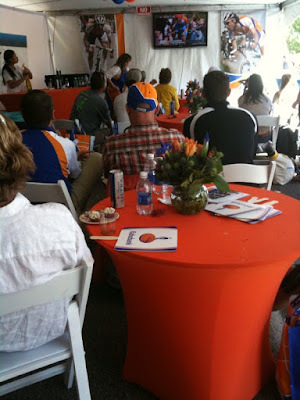 But not everyone in the VIP tent knows a flying flip about bike racing. Those VIP tickets are often business perks or gifts to woo clients. You will most likely spot the celebrities of cycling inside the tent, as well as local politicians, but I am most moved by seeing groups of friends clustered around a table with a beer in hand, or a parent and child out to have an inspiring special day together. A badge wearing cycling fan. VIP tents make memories. I recommend combining a choice VIP experience with sitting on the side of the road and meeting fellow fans who have traveled from out of town, or will share with you the most interesting stories and are true pro racing fans. A common dividing line of free and paid VIP spectators viewing at a bike race. Clean white table clothes and chairs under shelter make VIP tents a comfortable and convenient way to sit and watch the race live on TV while being tempted by the beautiful display of catered food and drink. Free swag items cover tables, welcoming you as drinks flow and everyone seems happy under the long white tent. In my opinion, VIP tents are best used as freedom: freedom to exit and return at whim, freedom to visit the team buses at the start, cruise the festival area and use the super nice restroom trailers included for use with your fancy badge (under which you feel so important as it dangles around your neck). And then return again to the peace of the white tent. The price however, is steep: $200-250. Each. Yes, VIP is luxury. Yes, I would recommend buying VIP tickets, but pick your stage carefully. My tip: When it comes VIP tickets is to buy quality location. Quality to me equates to visibility of the true race competition combined with need. I do not buy VIP to hob-nob; except with my family members who are never too pretentious to recognize "isn't this totally cool, let's meet some people!" In my opinion purchasing VIP tickets at a finish is preferred to buying VIP tickets at the start. 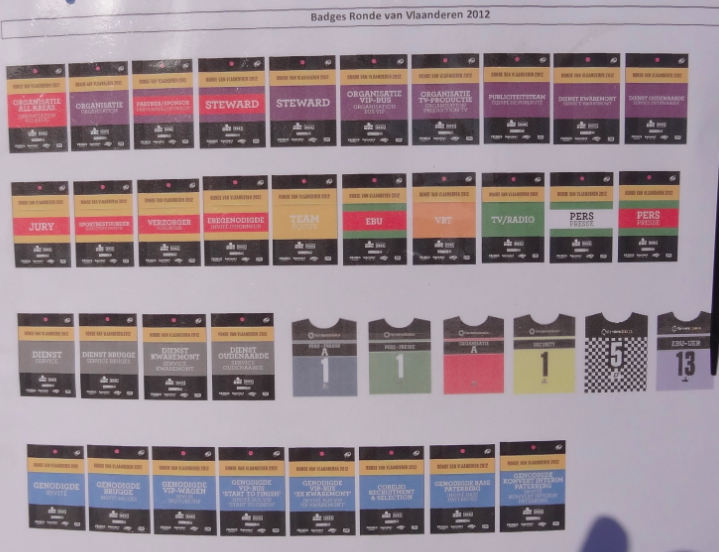 Read my individual guides to each stage to help you make your decisions. 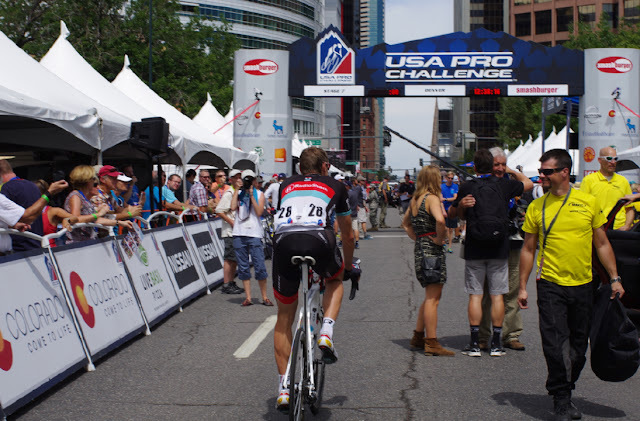 VIP swag offered on every table, in Denver, of the USA Pro Challenge in 2014! Some very happy VIPs were driven in these Lexus cars last year by Kimberly and Mari. Mari (right) is an Olympic Silver Medalist in cycling and involved in the Women's Pro Challenge race. This could be you. 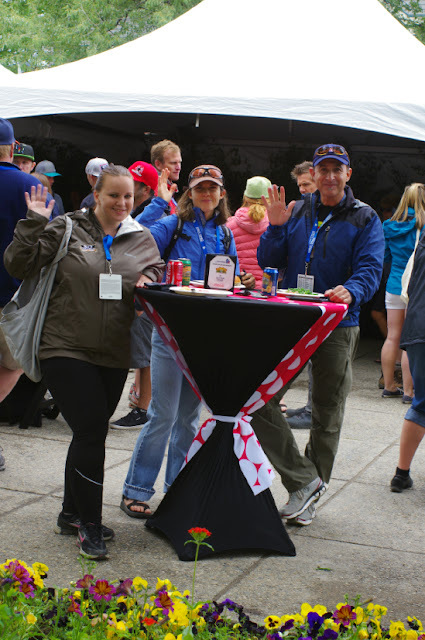 Happy VIP goers in Breckenridge, 2014. An exiting way to spend the day. 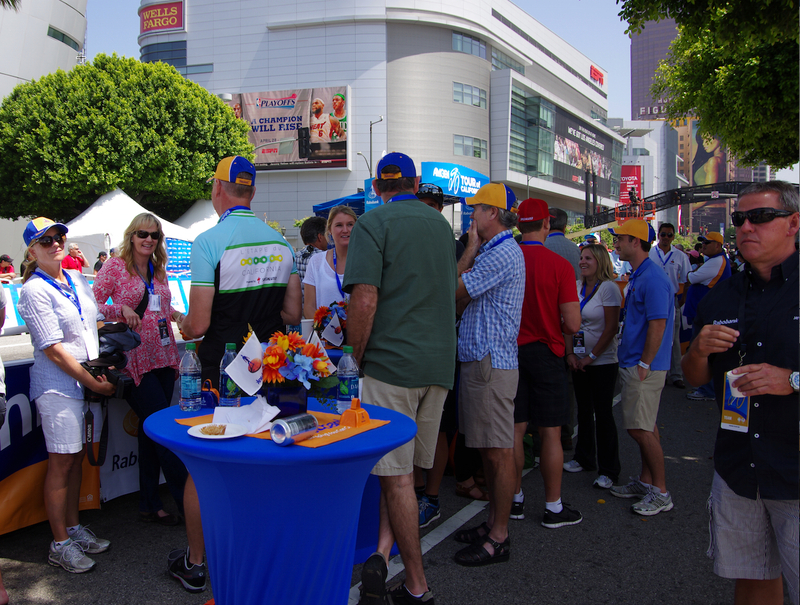 You will see riders stopping to chat with family or friends inside the VIP tents at the start. This happened to be Chris Baldwin (left) who was injured during a previous stage in 2013. 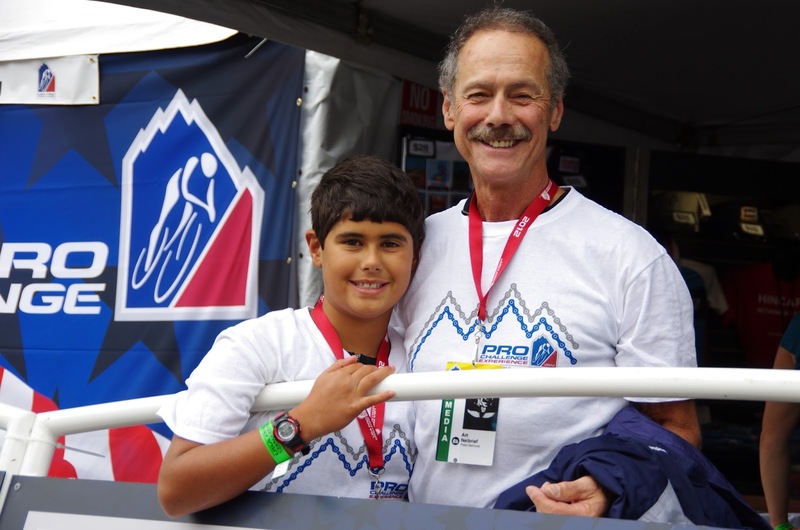 Race owner Richard Schaden (left) was seen biking to VIP in 2014. I think this is totally awesome! Friends, Race Announcer Dave Towle and journalist Neal Rogers of Velo News and GCN, have breakfast together before the start of a stage in 2014.
Who wants to talk politics on race day? That is the Mayor of Breckenridge of the right (in the funny hat). Now we are talking. Art and Gabriel, father and son, enjoying the VIP experience together in 2012. Delicious catering in every VIP tent (which I never seem to eat because I am busy talking, or they won't let me in!). I sure wish the Media Tent had food like this! 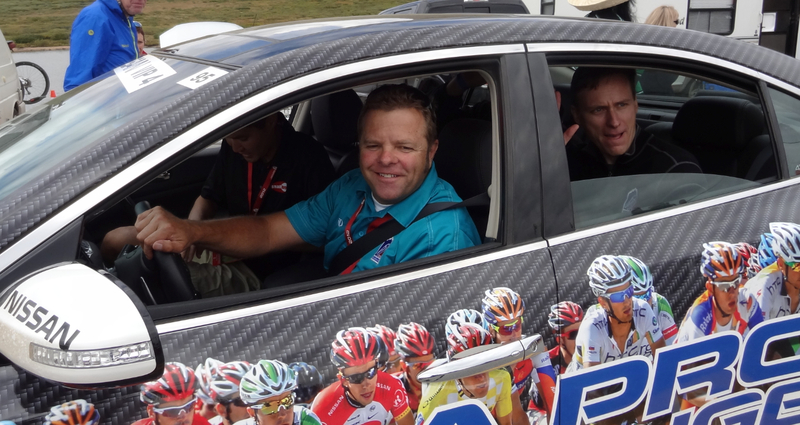 Ron Kiefel (7-11 team) drove former National Champion Dale Stetina in the VIP care over Independence Pass in 2012 . Bring a delicious picnic and set-up road side before the peloton passes. There will be lots to watch as you wait. You must admit this is a pretty cool way to spend the day waiting for a race. Arrive 3 hours early and enjoy a meal at a local restaurant. Now this is Product Placement - thanks LEXUS for the VIP tents! Although you will usually find me looking for coffee at a local coffee shop. My first ever VIP experience with family and friend (pictured) in Pau at the 2001 Tour de France. 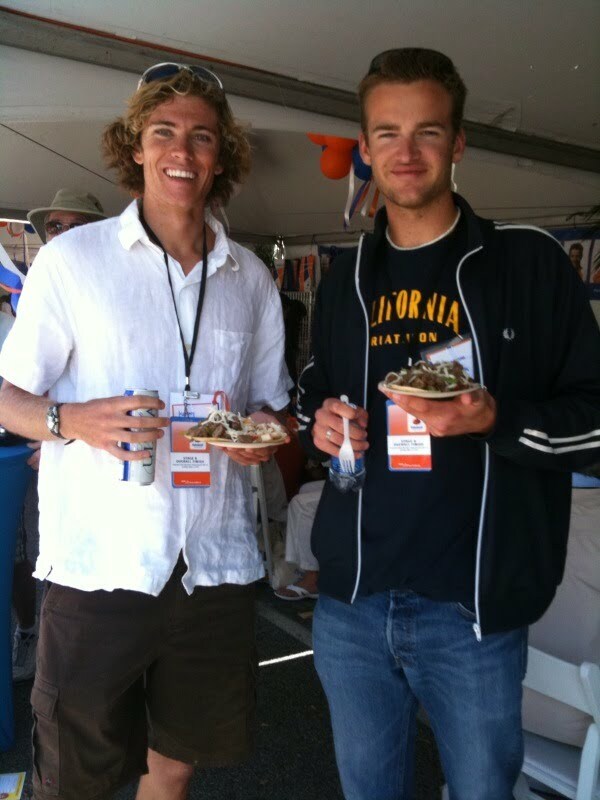 My second VIP experience was long awaited, in 2008, with my nephew Kenny (left) and plates full of food. It didn't take me long to realize VIP treatment with tables, swag and TVs is very fine. Enjoying VIP with my family in comfort and ease. This was the guide to the various levels of VIP passes at the Tour of Flanders in 2012. The height of VIP experience for me. I was so happy to have entrance to see the riders prepare for the RVV classic, more excited that I had arranged my VIP from the USA. Sometimes a wonderful town trumps a VIP Badge - there is no need. I did not recommend VIP at Stage Starts because: I like to spend my time moving around the race to see as many bikes, pro racers, team manager and mechanics as I can. You can often get a good view of the announcing stage and watch the riders roll by to sign-in without being restricted to the VIP tent at the start. In large cities, the VIP tent can be an excellent place to relax without trying to keep track of your entire clan. 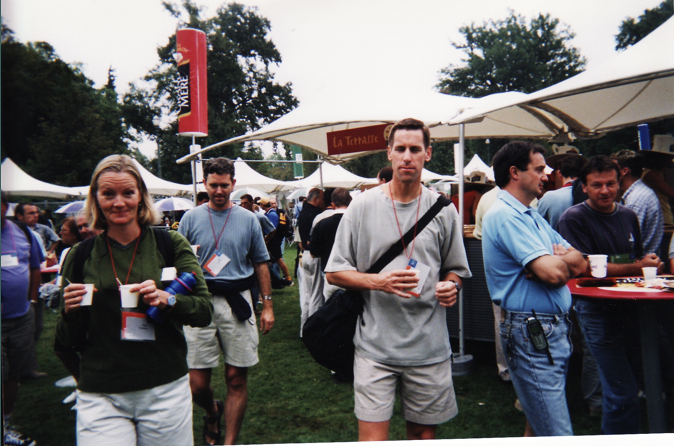 In small places, without great local food, VIP tents are also a good idea. Golden might be a good VIP start this year. Aspen Finish: because this town is so wonderful, I would want to be out eating in the fabulous local restaurants en plain air. Having a beer outside, walking around the Finish Festival, and greeting friends. 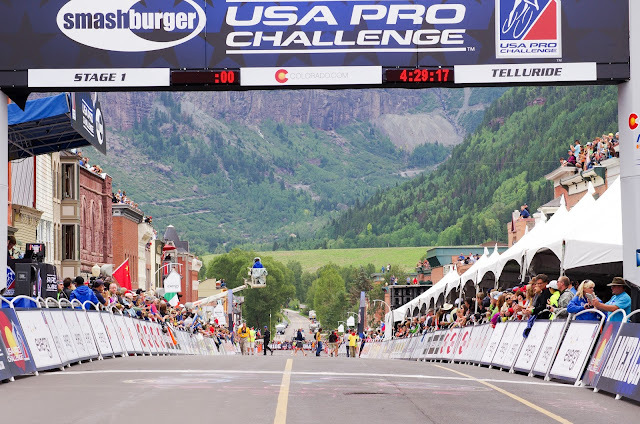 The presentation stage, where the jerseys are awarded in aspen, is not near the finish line. VIP sometimes grabs the best location at the finish line, so if that is important to you - buy VIP!